AND AN ENGLISHMAN CAME TO BILBAOOO! Born in Wolverhampton, England on 5th May 1883, Frederick Beaconsfield Pentland would become the most successful manager of the Spanish pre-civil war period and a “true” legend in Bilbao. After working as an assistant in manufacturing guns, young Fred became a football player for Blackpool in summer 1903 as a right forward. Later that same year he would start playing for Blackburn Rovers where he played for 3 seasons. After his spell at Blackburn he would also play for Brentford, Queen Park Rangers, and Middlesbrough. By 1908 the 25 year old footballer was excelling and as a consequence he earned a call to play for the national team; over the course of his career he would play 5 times for England. By 1912 Fred finished his career as a player at Halifax Town and showed keen interest in continuing his professional career as a manager. In May 1914, Fred was hired to manage the German Olympic football team. Unfortunately, just after moving to Germany the start of “The Great War” disrupted his plans and instead he became a prisoner along with other foreigners who were living in Germany. Fred and his inmates were concentrated in a stadium in Ruhleben until the war ended. Despite the bad luck Fred did not despair and along with other football fanatics he focused on organising a prisioners league; this admirable effort allowed the inmates to distract themeselves from the daily stress of being held captive. Once the war ended Fred managed to start his coaching career in 1920 by managing the French national team at the Antwerp Olympics; albeit with limited success. 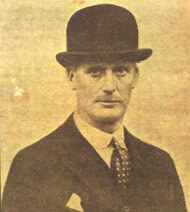 Mr Pentland made the most of the good reputation of English football in continental Europe and by 1921 he tried his luck in Spain coaching Racing de Santander. Nevertheless, this tenure was cut short as Athletic knocked on his door and convinced him to manage in Bilbao for 1,000 pesetas a month. 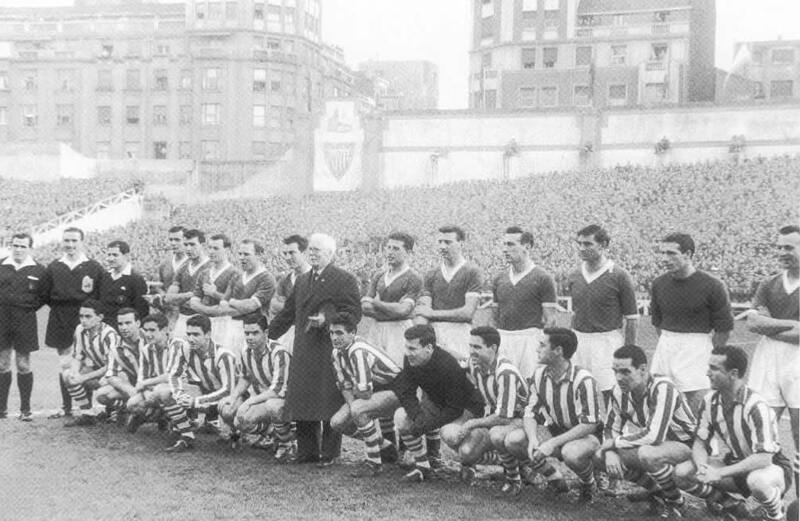 Athletic Club was accustomed to English managers and got along very well with their new coach. 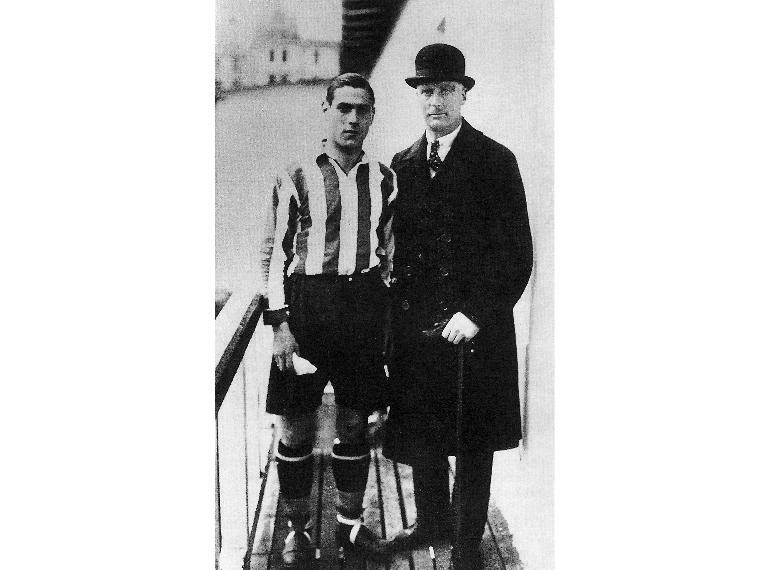 This good relationship also translated on the pitch and Athletic won the Cup in 1923 under his tutelage. Before Mr Pentland arrived to Bilbao, Athletic had already a British style of play since the team had previously been managed by a few British (Mr Burton, Mr Barnes and Mr Shepard). However, Mr Pentland surprised everybody when he advocated a strategy that valued possession based on a short passing game. Such a philosophy was hard work and it required many hours of training and the Englishman was rather peculiar as he even explained his players the right way to tie their shoelaces. Due to his demanding style, Mr Pentland is recognised as being the manager that slowly transitioned the club into professional football practices. The new way of playing advocated by Mr Pentland was revolutionary in its day. Most teams would typically play a 2-3-5 system (yes, 5 forwards!). But since possession was a key aspect of his style, Mr Pentland implemented a 2-5-3 system thus giving Athletic a clear edge in midfield. Mr Pentland was easy to recognize in Bilbao because he would usually wear a black bowler hat, carry an umbrella, and smoke a cigar. Even during matches he would wear his hat and smoke. Despite the formalities, Mr Pentland was a very warm character friendly with Bilbao citizens. And this personality showed in the pitch because when the team would win important matches the players would grab his hat, step on it, and leave it completely flat. Surely the high street shops in England were happy with such a good customer who needed many hats! 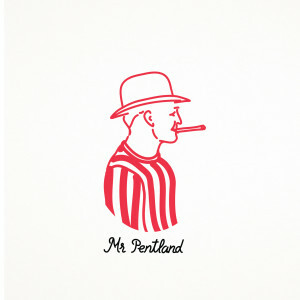 After the 1923 campaign Mr Pentland could not manage to agree a contract extension with Athletic and moved on. However, Fred stayed in Spain and went on to manage Atletico Madrid and Oviedo. 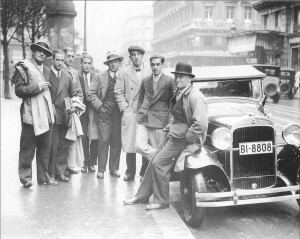 Despite this back and forth in 1929 Athletic would hire Mr Pentland again to lead them in their 1st Spanish “La Liga” tournament. 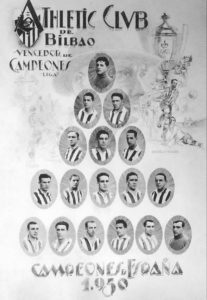 The second tenure of Mr Pentland in Bilbao, which lasted 4 seasons, would be a golden age for Athletic as it cemented their reputation as the team with the most trophies until the start of the Civil War. Furthermore, Mr Pentland’s experience and advise helped Athletic players and the club make a great leap forward towards professional football practices. 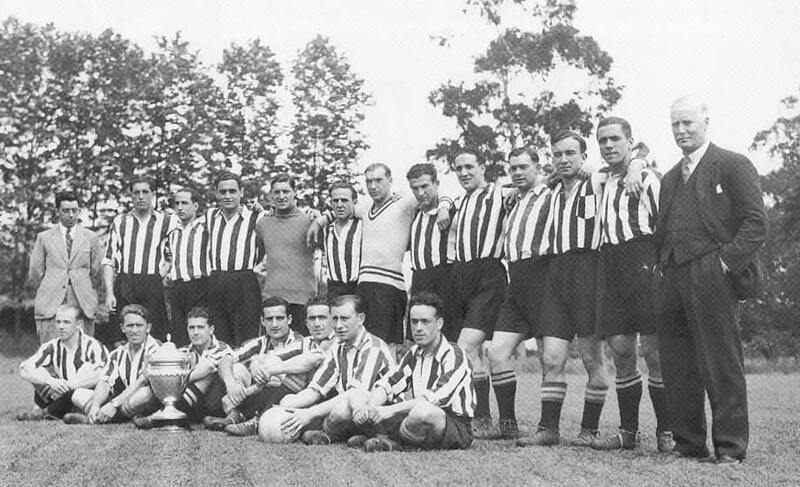 Despite finishing 3rd in their first league season, Athletic came on top of the league both in 1930 (undefeated) and in 1931. Meanwhile, in the 1932 and 1933 seasons they finished 2nd place. Athletic’s performance in the League were amazing, but what became legendary was the dominant form they displayed in Cup tournaments. It seemed Athletic played much better when playing elimination matches. After all, Athletic is known as the “King of Cups” in the domestic “Copa del Rey” tournament. Mr Pentland with a fantastic Athletic side made history by conquering the Cup 4 years straight in 1930, 1931, 1932 y 1933. Such success made Mr Pentland a loved personality in Bilbao and a coveted manager by top Spanish clubs. Unfortunately, in the summer of 1933 Mr Pentland didn’t want to renew his contract in Bilbao as he decided his cycle had come to an end and moved to Atletico Madrid once more. This tenure in Madrid was short lived as the Civil War started a few years later. When Spanish society entered the conflict Mr Pentland decided to return to England and coach at Barrow AFC until 1939 after which he retired. Despite Mr Pentland leaving Bilbao on a sour note Athletic never forgot his magnificent manager. He has always been recognised as the best manager the club has ever had and is still remembered with affection today. Athletic showed their gratitude and respect towards Mr Pentland one last time in 1959 when they organised a friendly match versus Chelsea in San Mames. This was a way of paying homage to a foreigner that made history at Athletic. The city of Bilbao welcomed their Englishman and Fred had the opportunity to say ‘Kaixo’ to many of his former players as well as kids of his former players who were now playing for Athletic such as Ignacio Uribe. Mr Pentland was awarded a medal for his services and was in the pitch for a formal ceremony before the match. This would be the last time Mr Pentland visited his dear Bilbao. Sadly, 3 years later, on the 16th March 1962 Frederick Pentland passed away at age 78. His legacy still stands today and Athletic fans pay their respect in many ways. For instance, Mr Pentland’s family has been invited a few times to visit Bilbao and attend matches in San Mames, while another form of recognition has been naming the official Athletic supporters club in London “MR PENTLAND CLUB”. 1883 – 1962 Wolverhampton, England. 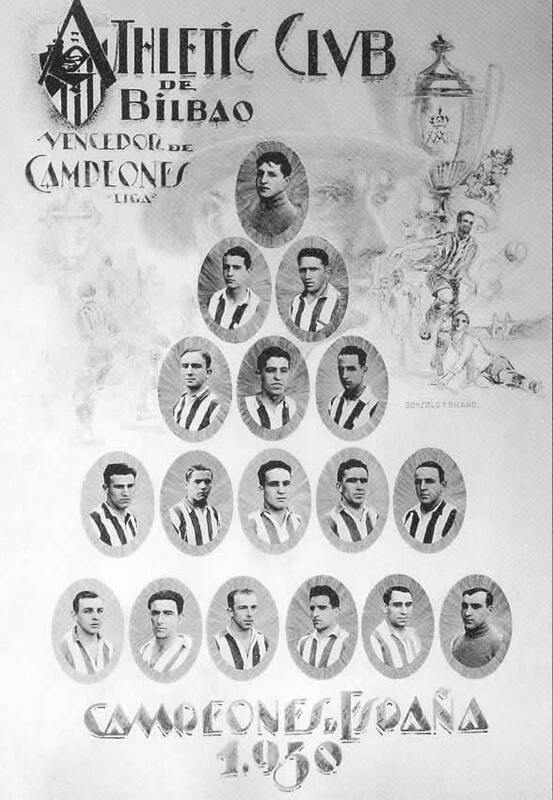 1930 Athletic poster celebrating its title! 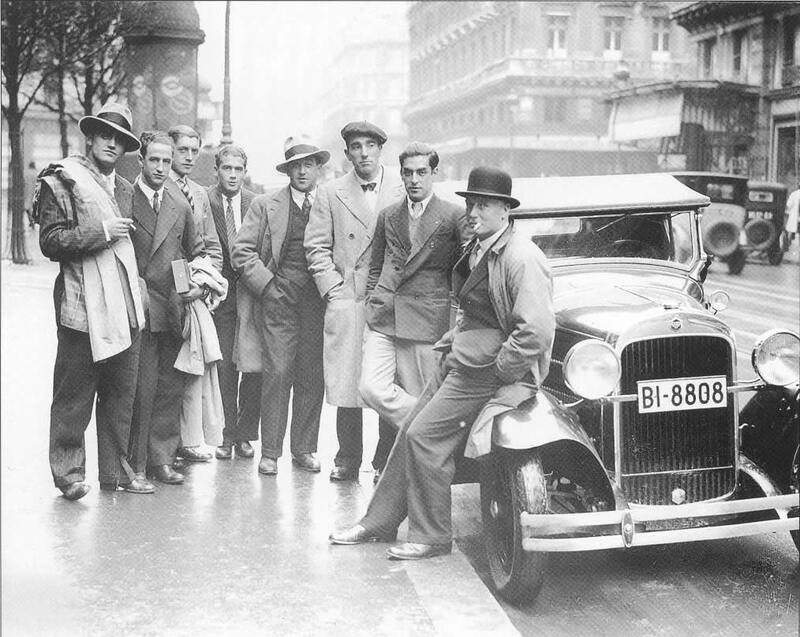 Athletic played Paris Racing in a friendly in which the lions won 5-1. 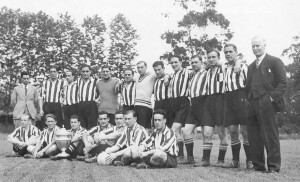 1933 Athletic Cup Champion side, Mr Pentland’s last silverware in Bilbao. between Athletic and Chelsea on 8th December 1959. 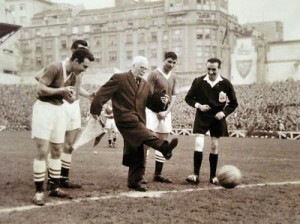 Mr Pentland makes the symbolic kick-off before the Athletic vs. Chelsea friendly.